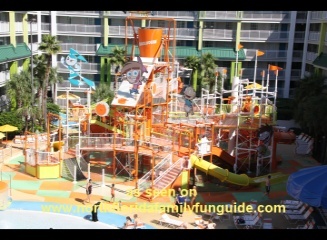 Centrally located close to everything you want to do in Orlando, is a fun packed, kid friendly family resort by Nickelodeon called the Nickelodeon Family Suites, or Nick Hotel. This Family Resort is loaded with kid favorite things to do, like a giant Oasis lagoon pool, with daily Nickelodeon Live shows poolside, a giant water park with twisting water flumes and a 400 gallon bucket that dumps slime on everyone daily! Exciting Live Shows your family can participate in like Nick Live Goes Wild, where two families compete, Nickelodeon Style, for the ultimate sliming prize! Audience participation is part of this wild interactive live show! Kid's favorite Nick Cartoon celebrities like Spongebob Squarepants and Dora make daily appearances in the "Mall" where you can get pictures taken. Bryan and I really enjoyed the 4-D Experience adventure movies! These movies take on a new dimension with feeling. Bryan calls them "Feel Movies" ! The chairs rumble, and vibrate, water sprays in your face, bubble cannons shoot bubbles throughout the theater, pickle , flowers, green apple, and other smells are released, and more! We saw 4 of these 20 minute short animated 4D movies, Wonder Pets, The Pirate Movie, Under The Sea, and Spongebob Squarepants! The Nick Hotel's 2 room Kid Suite was a favorite with Bryan. He loved the bunk beds in his own room, with the Spongebob theme everywhere, and his very own television playing Nickelodeon shows! I can't think of a more amazing place to take your birthday child for the time of their life!